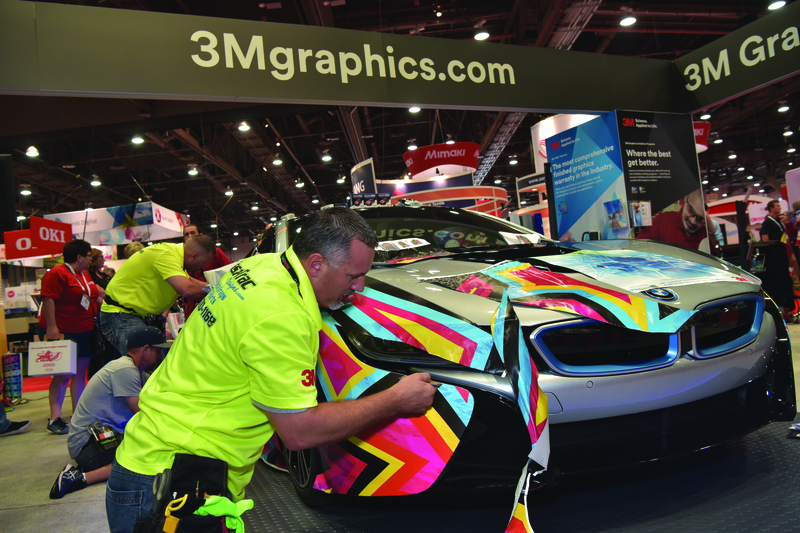 The art of the car wrap was demonstrated at the 2017 SGIA Expo, which took place in New Orleans. After months of anticipation, the 2018 SGIA Expo starts tomorrow in Las Vegas. In-plant managers from across the country are heading there now, eager to examine the latest wide-format, contour cutting, garment printing and other specialty technologies to enhance their in-plants' service offerings. As with every SGIA Expo, the show floor will be plastered wall-to-wall with the latest and greatest machinery, applications and consumables, created by experts responding to change with cutting-edge innovations. With more than 600 exhibitors covering more than 273,000 sq. ft. of the Las Vegas Convention Center, the 2018 SGIA Expo will be buzzing with excitement. Brands Talking Sustainability Luncheon (Thursday, Oct. 18, 12-2 p.m., $30): Discuss sustainability efforts, goals and objectives, and network to discover new ways to engage your customer base on sustainability-related issues. Opening Night Party (Thursday, Oct. 18, 7-9 p.m., Free): Celebrate the SGIA Expo at TAO Las Vegas and enjoy drinks and snacks while you engage with your peers. Women in Print Breakfast (Friday, Oct. 19, 7:30-9 a.m., $30): Join the Women in Print Alliance for a morning of connection and education, and share your work experiences with other women in the industry. To view all there is to see and do at this year’s SGIA Expo, head to www.sgia.org/expo/2018 for a full list of events, sessions and more. Next year, in support of the convergence of technologies and the blending and blurring of market segments and specialties, SGIA and NAPCO Media will launch PRINTING United in Dallas, Oct. 23-25, 2019. PRINTING United will bring you all of what you love about the SGIA Expo, plus a whole lot more.